Nobody in Hafizur Rahman's family asked too many questions when the money they sent home to Bangladesh doubled or even tripled within two to three months. "He was like a prince," says Mirza Golam Sabur of his brother-in-law. So when Sabur was told last May that his 55-year-old brother-in-law died suddenly of a heart attack, he was shocked. Shocking, too, was the discovery that the tens of thousands of dollars sent to Rahman by relatives in Europe and North America was largely gone. The funds that they planned to use to buy retirement homes for relatives in the southern port city of Khulna had disappeared in Bangladesh's volatile stock market. Woeful tales like the Rahmans' are multiplying across Bangladesh as the country's benchmark stock index, which has dropped 55% since early 2011, continues to fall. Although Bangladesh has seen booms and busts before during its stock exchange's 58-year history, the steep losses suffered over the past 12 months by millions of small investors threaten to bring fresh economic and political turmoil to a long-suffering nation that seemed, at last, to be gaining ground. Between 2006 and '11 Bangladesh's booming garment industry fueled average economic growth of 6.3%. In 2005, Goldman Sachs included Bangladesh among the "Next 11" rapidly emerging economies to succeed Brazil, Russia, India and China. J.P. Morgan followed suit in 2007, including Bangladesh in its "Frontier Five" markets. Today, though, the market's dramatic rise  and swift fall  seems like a cautionary tale for emerging-market investors oblivious to the perils of hasty banking deregulation and rapid capital inflows. So what went wrong? The country's growth spurt was fueled by the garment industry, where some 2.5 million workers toiled for about $40 a month, a third of wages in southern China. Low costs helped Bangladesh become a hub for global apparel makers, including H&M and Li & Fung. In 1993, the value of Bangladesh's garment exports was under $2 billion, according to Stockholm-based Brummer & Partners, a large private-equity-and-hedge-fund company that invests in Bangladesh. By 2011, garment exports had risen sixfold to $17.9 billion. Polo shirts and blue jeans were paired with another fast-growing export from Bangladesh: Bangladeshis. Some 5 million Bangladeshis work abroad, many as construction workers, mariners and restaurant owners in Southeast Asia, the Middle East and Great Britain, and the $12 billion they sent home last year swelled Bangladesh's $100 billion economy with cash. Coupled with the earnings from garment exports, that cash flooded into more than three dozen banks across the country, many of which were newly licensed, small and unprofessionally managed. As inflation crept up and more banks entered the marketplace, the pressure to generate higher returns for depositors mounted. That, in turn, turned banks into stock-market players. The central bank allowed banks to invest a tenth of their total liabilities in the market. "This was considerably less restrictive than the international norm," says Ifty Islam, managing partner at Dhaka-based investment firm AT Capital. As banks poured money into stocks, the market rocketed skyward. In 2010, the benchmark index of the Dhaka Stock Exchange climbed over 90%. Such heady gains fed a hunger for investing among small-time players, even among those who knew little about the stocks they were trading. According to AT Capital's Islam, retail brokerage accounts in Bangladesh jumped sevenfold from roughly half a million in 2007 to 3.5 million by 2010. "Many people didn't have any investment knowledge," says Sabur. "But the market was so bullish everyone was buying." Unsurprisingly, the bubble soon burst. By the end of 2010, inflation had climbed past 11%, pushing up the price of staples. Alarmed, the central bank began tightening, in part by proposing stricter limits on banks investing in the market. That became the trigger of a punishing one-year-old market decline that's wiped out all the gains of 2010 and is now threatening to widen into a more serious economic and political crisis. As Europe's demand for garments slows and fewer Bangladeshis find work abroad, the country has begun to run a current account deficit. That is eroding the value of the Bangladeshi taka, which has dropped by roughly a fifth against the dollar over the past two years and is accelerating the market's slide. "It's going to get worse before it gets better," predicts Arjuna Mahendran, the Singapore-based head of investment strategy for HSBC Private Bank. 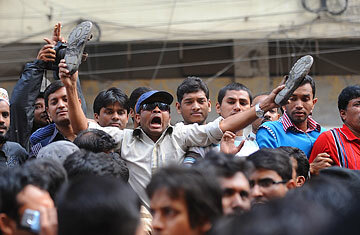 Worryingly, high food prices are stoking public anger against the government Sheikh Hasina. Over the past year, groups of disgruntled investors have been regularly gathering outside the stock exchange's Dhaka headquarters to burn tires and protest, venting their frustration with a regime they feel has not taken adequate steps to curb market speculation and protect small investors. Last April, a committee led by Khondkar Ibrahim Khaled, a respected former banker, submitted an official report to the government that alleged extensive market manipulation prior to the initial Jan. 2011 crash, ratcheting up tensions ahead of a general election to be called by mid-2013. Decades of steady economic progress won't be necessarily unraveled by a market rout alone. Kiron Bose, chief investment officer of Brummer & Partners' Bangladesh-focused private equity fund, emphasizes that the stock market has not traditionally been a major source of capital for Bangladesh. Analysts say the country's larger banks are solvent enough to continue lending to companies and individuals, albeit at double-digit interest rates. "I still believe in the country's long-term story," echoes AT Capital's Islam, who points out, for example, to a report by the consulting firm McKinsey & Co., which says if Bangladesh can upgrade its road and ports and Chinese manufacturing rages continue to rise, the country's garment exports could further double to surpass $40 billion over the next decade. Even so, to small investors like Sabur's late brother-in-law, hitching his fortunes to a roller-coaster market was a devastating ordeal. Read "Bangladesh's 'Banker to the Poor' Faces a Political Battle to Survive." Watch TIME's video "Creating New Land for Climate Refugees in Bangladesh."